Fund for Assistance to the ROCOR - Pristine beaches, exotic food, and... Orthodox Christianity? FFA supporters save Orthodox community in Bali from rent closure. Thanks to your unflagging support, the Orthodox Church is continuing to grow in the far East! "As a popular destination of world tourism, the cost of living in Bali is quite expensive. Especially food, house rent and transportation. That's why we always ask for outside help. But we believe that with God's help all these difficulties will be overcome." That, as you'll find out, is a tremendous understatement. Originally, Fr. Alexander looked for a cheap option to serve his flock. He found a small chapel in Singaraja, North Bali, but most people who travel to Bali cannot get to Singaraja, because it is too far away. The only option was to find something in the capital of Denpasar, the tourist hub. As expected, everything in Denpasar is much more expensive. "I had not found a place. I traveled around Denpasar to find a cheap and comfortable place. After finding the place, the next problem was the cost of renting the premises." At a certain point, the congregation was so behind in payments that the landlord threatened to evict them. "I felt very ashamed," said Fr. Alexander. "At that moment I thought, if there is no money, then the only way is I have to sell my own house." What a humble, hardworking servant of God! But God provided, through your generous help! "In the end, the grants came from the FFA." "Thank you, Fr. Alexander and FFA, for now our services are starting regularly. I'm glad that ceremonies will be happening regularly." However, this is only the beginning for Orthodoxy on Bali. 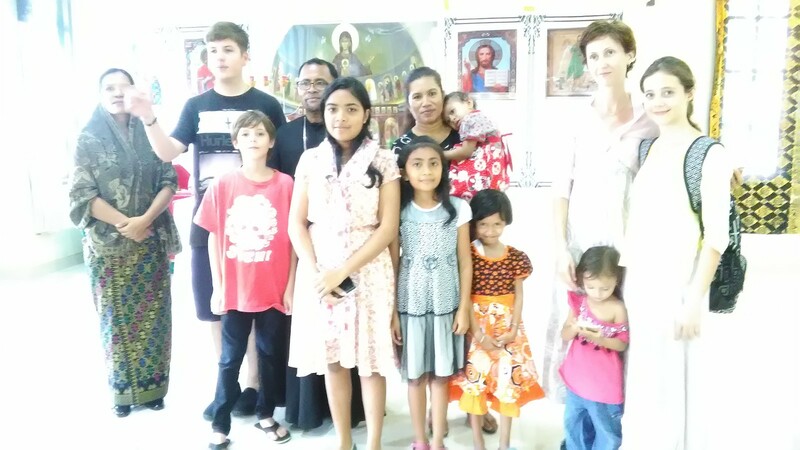 "We are aware that the mission of ROCOR Bali can only run well and regularly if supported with sufficient funds. We are not yet independent in the funding field. We still rely on help from ROCOR." Don't forget our brothers in beautiful Bali! Donate to help Father Alexander today. Perhaps, with your help, he will be able to purchase a church in the near future.